If you live in the New York area, we highly recommend you see this excellent film. HEADING HOME: THE TALE OF TEAM ISRAEL has six encore screenings August 5-7 at the Marlene Meyerson JCC Manhattan, 334 Amsterdam Ave. at 76th St. They’re part of a summer series showcasing independent film after Lincoln Plaza Cinema’s closing in January. HEADING HOME will play the following times. Directors Seth, Daniel and/or Jeremy will be at each screening for Q&A. Buy your tickets today! Sunday, August 5, 2pm. For tickets click here. Sunday, August 5, 4:30pm. For tickets click here. Sunday, August 5, 7pm. For tickets click here. Monday, August 6, 7pm. For tickets click here. Tuesday, August 7, 5:30pm. For tickets click here. Tuesday, August 7, 7:30pm. For tickets click here. 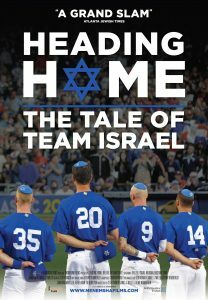 A stirring story of sports, patriotism, and personal growth, HEADING HOME charts the underdog journey of Israel’s national baseball team as it competes for the first time in the World Baseball Classic. HEADING HOME won Best Doc Awards in the DC, Philly, and Boca Jewish Film Festivals and the Family Film Award in Tampa Bay.